Autism Awareness and All of the Resources! Resources for You: On Teacher Coaching and New OSEP Letters! 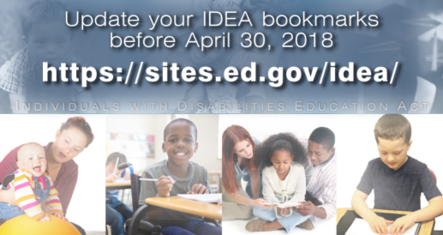 Starting today, April 30, the outdated Building the Legacy: IDEA 2004 website (Legacy site) automatically redirects users to the new and much improved Individuals with Disabilities Education Act (IDEA) website (new IDEA website). We encourage users to update their bookmarks to the new IDEA website—url below—today! Information that was previously on the Legacy site has been made available on the new IDEA website's "Building the Legacy: IDEA 2004" historical reference page. Thanks so much for reading this month's edition of the OSEP Update. We've shared a wealth of information and resources below. In addition, I'd like to point you to our recently archived virtual symposium. We truly appreciate those of you who joined us for the live event—there were some great questions! The symposium brought experts from across the field together to discuss high expectations, appropriate supports, and the importance of individualized education programs (IEPs) for children and youth with disabilities, especially in light of the recent U.S. Supreme Court ruling that addresses these topics. We've been collaborating with many of our partners in the field, including our fantastic technical assistance (TA) providers. On April 24–26, OSEP joined forces with the Center for IDEA Fiscal Reporting (CIFR) to host the IDEA Fiscal Forum 2018 in Atlanta, Georgia. The forum's sessions focused on helping states meet their federal obligation to collect and report special education fiscal data. I had the opportunity to address participants on how we integrate a fiscal focus with the results focus in Results Driven Accountability, and shared ways states can best use funds to focus on results. I invite you to read more about April TA activities in "Results Driven Accountability" below. As a final note, the President signed into law the Department of Education Appropriations Act, 2018 (as part of the Consolidated Appropriations Act, 2018) on March 23. States and lead agencies should check their email for more detailed information from OSEP. All of our stakeholders are invited to view the budget state tables on the Department's website. This month, the Office of Special Education and Rehabilitative Services (OSERS) has featured resources, information, and personal stories from researchers, parents, and professionals working with children with autism on our Twitter account and blog, so be sure to check them out! We want to highlight another great resource, the Interagency Autism Coordinating Council’s (IACC's) website, which houses information about autism awareness and related events. 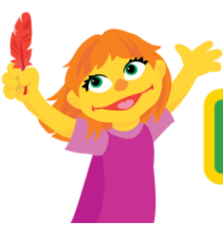 IACC held a panel presentation earlier this month featuring the Sesame Workshop. The panelists shared the story behind the creation of Julia, the first Muppet with autism (pictured left). A video recording of the presentation is available online. OSERS is currently seeking input from the public through its blog. We are seeking comments, particularly from state educational agencies and state lead agencies, on how best to provide TA to states on the collection and reporting of data required under IDEA Part B, Sections 618 and 616. This includes input on the most effective and efficient method of funding this TA. The blog post, which contains additional information and questions to consider when providing input, will be open for comments from April 24, 2018 through May 24, 2018. OSEP has issued the results from its initial review of states’ 2016 SPP/APR submissions. This kicked off the clarification period during which states with questions about OSEP’s comments or about SPP/APR requirements can request assistance. We encourage states to take advantage of this opportunity and schedule a phone call with their state lead. Clarification for IDEA Part C was April 9–24 and April 13–27 for Part B. States also submitted their SSIPs, which were due on April 2. OSEP is currently reviewing the submissions, and from early July to Aug. 15, 2018, state leads will be available to discuss SSIP feedback with states who request it. On April 12, OSEP held its monthly National TA Call for states. The call focused on highlighting key aspects of the IDEA Data Center’s soon-to-be-released Parent Involvement Data Toolkit. The toolkit was developed to help states 1) improve the quality of parent involvement data they collect; 2) improve the types and quality of the analyses they conduct of this data; and 3) expand the ways in which they disseminate and use the data. OSEP-funded TA centers conducted several collaborative DMS activities this month. On April 16–17, the National Center for Systemic Improvement (NCSI) held a meeting for states and other members of the Results-Based Accountability cross-state learning collaborative. Participants discussed co-developing resources to support states in designing and implementing comprehensive general supervision systems that improve outcomes for students with disabilities while maintaining compliance under IDEA. On April 26, TA providers from DaSy (the Center for IDEA Early Childhood Data Systems) led a discussion with OSEP staff on reviewing the IDEA Part C evaluation of the infrastructure improvements component of the SSIP, and shared the general approaches states are using in their SSIP evaluation. CIID recently released Generate, a new software application that has been successfully used by five states this spring to submit their 2017 IDEA Part B child count and educational environment data files! The software is available to state educational agencies (SEAs) to 1) improve data quality through a standardized process, and 2) automate and simplify IDEA Part B reporting to EDFacts and for state SPP/APRs. You can request the Generate software application package, view a demonstration video, and access user guides and other relevant resources here. DaSy recently unveiled its latest special collection of resources, Child Outcomes Reports. This collection provides a convenient means for users to access a variety of IDEA child outcomes data reports that select state agencies have produced for their local early childhood programs. As users will note when perusing the collection, the featured states have offered many examples and templates that are intended to assist other states in this work. We invite you to check out the recently redesigned Early Childhood Learning and Knowledge Center (ECLKC) website from the U.S. Department of Health and Human Services' Office of Head Start. While exploring, users can navigate the ECLKC content topics from the main menu bar, and subscribe to email updates. 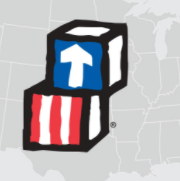 The site provides the latest evidence-based information, training materials, and resources that respond to the needs of Head Start and Early Head Start programs. In addition to its broader TA tools and resources, the OSEP-funded State Implementation and Scaling-up of Evidence-based Practices Center (SISEP) offers online lessons via its Active Implementation Hub (AI Hub). As part of a new coaching series on the AI Hub, SISEP recently published the lesson “Coaching as a System of Support.” The lesson will take you on an interactive journey that unpacks research-based skills, practices, and contextual considerations for coaching. Support Models: Matrix and Discussion Guide for K-12th Grade Systems. This resource helps teams of administrators, educators, and other stakeholders at the state and local levels ensure that the model of support they have implemented, such as teacher coaching, systems coaching, or training, leads to the desired outcomes. This could include increased knowledge or understanding of systems across teams, and improved teacher practices. Effective Practices for Coaches. This module is the first in a series on coaching, and focuses on teachers who work in the kindergarten–12th-grade setting. It addresses the four practices coaches can use to improve teaching and student learning: observation, modeling, providing performance feedback, and using alliance-building strategies. The second module in the series will be released later this year. April 18, 2018: Letter to Kane addresses whether local educational agencies must provide compensatory services to make up special education and related services missed when children with disabilities participate in required scheduled state assessment testing. April 19, 2018: Letter to Carroll addresses the provision of IDEA services when a preschool child with a disability does not attend preschool full-time. April 19, 2018: Letter to Zirkel addresses whether a teacher or other district staff member on an IEP Team may enter a dissenting opinion on the IEP or elsewhere in the student’s record. April 19, 2018: Letter to Lipsitt clarifies a state educational agency’s authority to award compensatory services to redress violations it identifies through the IDEA state complaint procedures. As a result of funding from ED's Institute of Education Sciences (IES), researchers at the University of Kansas have developed, evaluated, and replicated an intervention-based system for improving teachers’ classroom management and students’ academic engagement. 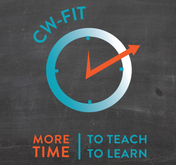 It's called Class-Wide Function-related Intervention Teams (CW-FIT) and it has two components: 1) Tier 1 is a class-wide intervention program, and 2) Tier 2 consists of individualized interventions. students at risk for challenging behaviors who participated in CW-FIT demonstrated improvements in engagement and reductions in disruptive behavior. On April 23, ED hosted ParentCamp: Informed Families Thrive—Preventing the Summer Slide. This event was a series of workshops, facilitated by ED staff and invited guests, that brought parents, students, educators, and faith-based and community representatives together. They shared their experiences, concerns, solutions, and resources related to the topic of summer slide. 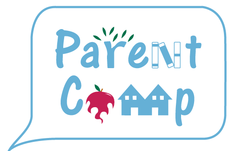 ParentCamp is designed to help participants make informed decisions about their children's education. Visit ED’s family and community engagement website for more information about all of the Department's ParentCamp events. In collaboration with our colleagues in the Office of State Support (OSS), we offer a reminder that the State Support Network (SSN) is available to provide individualized consultation to states on ESSA implementation. These consultations allow states to connect with subject matter experts as thought partners on specific areas of ESSA implementation, or to walk through available planning tools to jumpstart the state's implementation work. Consultation sessions will be a one-time, 90-minute engagement between a requesting state and an SSN representative. If you are interested in this opportunity, please reach out to your state’s OSS program officer, who will connect you to the SSN team. OSS program officers can be reached by email at OSS. [nameofstate]@ed.gov (e.g., OSS.SouthCarolina@ed.gov). This month, we interviewed Nancy Thompson and Janine Figiel from the Jolly Toddlers child care center in Southampton, Pennsylvania. Thompson and Figiel shared with us what it takes to create a positive, nurturing, and collaborative child care environment that benefits both early childhood program staff and the children in their care. One of the ways Jolly Toddlers has done this is by successfully implementing the Pyramid Model to improve young children’s social competence. Check out the full interview on the OSERS Blog. 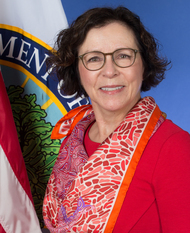 OSERS Assistant Secretary Johnny Collett has joined the conversation on Twitter to share even more OSERS-related updates!